“Uhhhh...” came a faint groan from a dark, dank, and otherwise run down apartment. “That’s the last time I have a bowl of sugar and three pizzas all wrapped in a tortilla dipped in syrup,” said the masked mare as she stumbled onto her feet. She steadied herself and waltzed over to the window across the room. As she pulled up the shades, the bright sunlight illuminated the small apartment. Candy wrappers littered the floor, some places in piles, and the small TV situated in-front of a beat up couch was covered in confetti. Adjusting her mask to better see, she saw that it was another beautiful day in the city of Manehatten. Another boring day... a non-existent voice chimed in. “Boring? How can watching TV and shooting the occasional fly be boring?”, the mare said to herself. She hoofed over to the couch, jumped, and landed on the dusty thing with a thud. She kicked the small television and it sparked to life. “Commercial....soaps....Equestria’s Most Wanted...” the mare’s eyes suddenly filled with excitement. On the screen was a wanted poster of none other than her, the great Mare With A Mouth, Pinkiepool! “Awwww, they didn’t even get my good side,” Is it me or does that suit make you look fat? “Wouldn’t that mean you’d look fat too?” ….Point taken. As she continued to discuss her weight with herself the story continued. It span a great tale of Pinkiepool blowing up castles owned by dictators, mansions owned by millionaires, and bakeries owned by bakers. Deciding to agree to disagree with herself, she reflected on how much money (or cupcakes in the bakery’s case) she had made from some of the jobs the report had mentioned. Maybe you shouldn’t have spent all that cash on helium balloons. She looked over to her “Pinkie Hot-Line” and noticed it didn’t ring. “That’s one cliche out the window I guess,” she said sadly. Pinkiepool’s regular taco stand was by far one of the best in Manehatten and was known to have “discounts” for gun wielding marecenaries. Pinkie made her way merrily down the street ignoring worried looks she received from citizens upon seeing her weapons decorated all over her. As Pinkie hopped around the second to last block before taco heaven, she neglected to noticed the large hole in the skyscraper above her. Well if they don’t we could always rob a Taco Bell for it’s sauce. “That’s why I brought C4 with me, silly billy,” Pinkie chuckled to herself as she remembered the last time she mixed C4 with fast food. I still haven’t been able to watch Law & Order for months. “Oh, don’t be such a-” Pinkiepool stopped as she turned the last corner and saw that her once precious taco stand was now a crater in the ground. Pinkie’s tail twitched, her knees buckled, and her ears flopped as she slowly pulled off one of her katanas. Suddenly her answer came dropping out of the sky as a large, muscular, angry green pony fell from the sky. Several other ponies in green jumpsuits swarmed around the green mare and began shooting her repeatedly. The jumpsuits were covered in what looked like bean stains and that was enough to convinced Pinkie they were to blame. Pinkie decided to join in on the fun and threw a grenade into the fray. The jumpsuits galloped away, expecting an explosion, only to be covered in silly string as the “grenade” went off. The jumpsuits regrouped and continued spraying their fire openly, this time utilizing darts. Pinkie decided darts were no fun and unloaded her favorite pair of pistols into the unfashionable crowd. The jumpsuits began falling one by one, screaming in pain from Pinkie’s fire while the rest were being launched to the stratosphere by the incredible FlutterHulk. One began screaming, “We need evac now!” desperately into his ear mic. That was all Pinkie could make out before she was blown back by a powerful gust. Above her was a large shuttle with the acronym “H.Y.D.R.A.” written on the side. The green mare was already attempting to bring it down so Pinkie simple sat back and wished she had some popcorn to pass the time. After what felt like ten minutes, Pinkie was getting bored of this one sided fight. Time to play pin the tail on the pony! Pinkie smiled to herself as she took several of the jumpsuits from fallen grunts and tied them together to make a rope. She tied one end to a fallen street light and another to an exposed beam inside what was once a hat store. 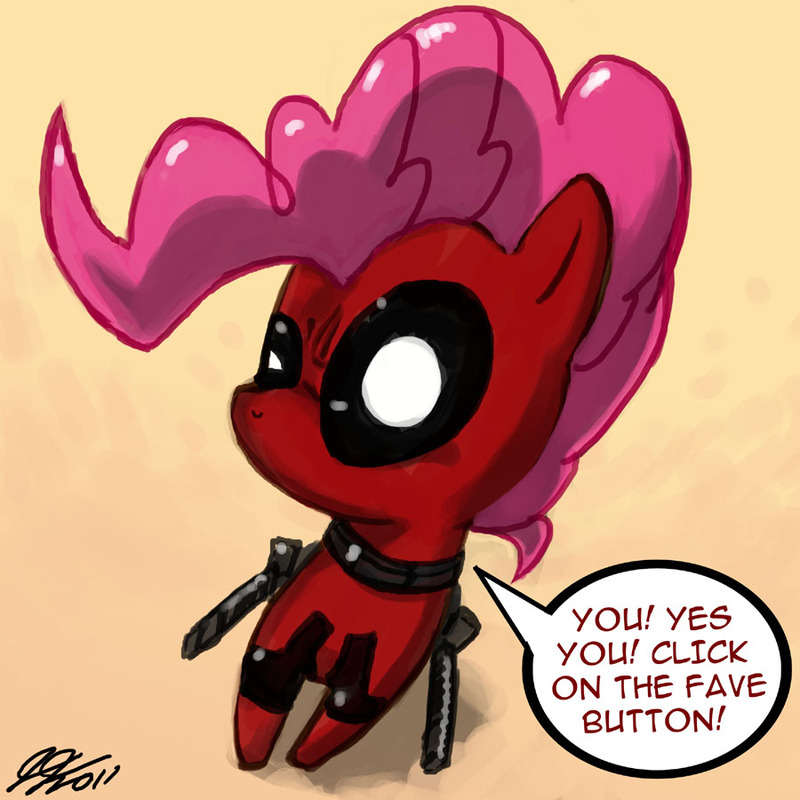 Pinkie lined herself up with FlutterHulk, with a katana back in her mouth, and launched herself into the air. Pinkiepool neglected to note the fact this creature was seemingly unstoppable and upon reaching her target found a muscular hand gripping her head. “Didn’t think this one through.” You never think, that’s why it’s so quiet in here. Roaring into Pinkie’s face, FlutterHulk chucked her towards another shuttle that was the of the same model as the five now in pieces about the street. As Pinkie hurtled towards the metal craft she saw what looked to be a wheel and a multi-colored umbrella both seemingly from a stand of some sort on its underside. She went straight through the craft’s belly into what looked to be a cargo area. Hey, I think we’re blacking out, she heard before she blacked out. When Pinkie awoke, she held her pounding head in her hooves. Can you believe there’s no packed peanuts on this flight? “Oh good, you’re still here,” she said happily to no one. She was suddenly lurched backward into the wall in what felt like an aircraft ascending. That felt like an aircraft ascending! “I know, I read the last sentence,” Pinkie responded. The door behind a few fallen crates opened with a whoosh. “Is someone in here?”, asked a grunt as he walked about the scattered crates. Pinkie was already behind the young and scrawny minion when he turned around and met a costumed hoof to the face. The colt groaned as Pinkie finished bounding him to a nearby pole. “What...what happened,” asked the H.Y.D.R.A. grunt. “Ah, you’re awake.” exclaimed Pinkie as she sat and polished her pistol in clear view of the bounded colt. Pinkie put her gun away and slowly lifted her mask above her mouth showing her wicked smile. The grunt felt sick as he saw what was truly under that red mask and wondered if that was about to happen to him. Pinkie calmly walked over and in-front of the colt’s terrified face. The colt sat dumbfounded, TACOS? WHAT DO TACOS HAVE TO DO WITH THIS? “I asked you a question and I’m very hungry and I’d hate to have to...resort to the alternative meal.” Pinkie said low and as creepy as should could. All those nights of practicing our Bale voice is paying off! “What....what alternative?”, he asked as a cold sweat began forming under his spandex hood. Pinkie walked behind the colt. The colt could feel Pinkie breath on his neck as she pulled his head away from her, exposing his neck. Pinkie drew her head back and the colt squeezed his eyes shut. There was a soft, juicy sound as Pinkie bit into something. The colt slowly opened his eyes and saw that the playfully merc had bitten into a fresh apple. After the aircraft had landed, Pinkie dropped through the hole she had made earlier. She saw that the craft was a only few blocks away from where she had been thrown and was now in view of the bay. Pinkiepool “borrowed” a boat from the Manehatten docks and was now right above where the submerged hideout was. She used the small transceiver the colt had “given” her to access a hidden tunnel leading straight down to the main facility. A metal door hidden under the sand in the semi-shallow water opened and Pinkie donned her rubber duckie floaties and air tank before jumping into the water. She kicked her way over to the door and slipped off the duckies before making her way downward into the steel tunnel. After several minutes of swimming, she finally made it into a large docking station full of grunts running back and forth saluting one another. Pinkie took cover by carefully swimming between and behind several submerines that were currently docked. Once she reached a wall and the coast was clear enough, she made her way into a cramped air duct that seemed to stretch into oblivion. Pinkie made her way continuously down the long duct, her swords making a loud scraping sound when hitting the metal interior. “You know, for a secret underwater base the security stinks.” I don’t see what makes Bond so special. Pinkie grew bored of stealth and when she came to the next opening exited the duct and began lobbing grenades about to draw attention. An alarm indicating fires on level 3 had began, Pinkie felt some satisfaction as she remembered her poor tacos being murdered by these barbarians. “A multi-million dollar underwater base for a taco stand seems fair by my standards,” she murmured. After several long corridors full of grunts, long firefights, epic wedgies, and a impromptu break out into Thriller, Pinkie arrived at what had to be these guys so called “bosses”. Thinking of the coolest way to enter she inadvertently leaned against the door and fell backward into a massive domed room. Towering before her was a large, multi-headed Hydra. Like you didn’t see that coming. It roared with all it’s many heads and sent one to wrap around Pinkiepool. Pinkie reacted quickly rolling out of the way and drawing her sword just in time to see the head staring at her from above. It made a quick dash toward her only to meet a cold steel blade that cut it halfway down the neck. Pinkie laughed mightily at her own lame joke so much so that she didn’t notice the two heads growing from the cut neck. Pinkie was quickly surrounded by the Hydra’s heads. She cut, slashed, and scrapped to her heart’s content but to no avail. Soon there were hundreds of heads all around her licking their hungry lips as they wondered what she’d taste like. She was quickly thrown into the air and eaten. Landing with a thud, Pinkie rubbed her hoof on her costume as it landed in something she hoped wouldn’t stain. “ECHO!” she yelled and was meet with reverberations of her voice. “Man it’s awfully dark in her,” she proclaimed as she frisked her pouches for a match. Pinkie reached and grabbed the candle lighting it carefully in-between her hooves. The bright red candle was quite helpful in illuminating the inners of the beast, up until the fuse grew short enough to show the letters “TNT” in bold along the side. The merc chucked the “candlestick” as far as she could, but as she did so, the fuse caught on a lose pin on her grenade belt making the pineapple live. “I hope you like pineapples!”, she bellowed as she frantically tried to take off the belt before finally flinging it after the stick. When the TNT blew it caused a massive chain reaction with the belt that was not far behind it. The Hydra coughed smoke and flames as the explosives did their work. They were lurched back and forth as the grenades propelled their insides in several directions. Unfortunately for the Hydra, it’s heavily under-payed interns had left high explosives meant for the armory outside in the open hallway to which it was rapidly heading towards. Once the last grenade blew, (an extra crispy) Pinkie and a stream of fire hit the misplaced munitions. A large hole was blown in the hull of the underwater lair flooding the hallway the Hydra was in. Pinkiepool was propelled upwards toward the surface. She shot out of the bay at mach speed leaving a trail of smoke behind her. Hey, I can see the apartment from here! Pinkie continued to climb higher and higher into the sky. She held out her front legs and pretended to soar like a mighty eagle even up till she slowly peaked in her ascent. Once at her peak, Pinkie began rapidly flapping her limbs about hoping to keep herself in the air. Her rapid decent soon began and Pinkie wasn’t the slightest bit worried. “It’s a good thing I wore my parachute equipped suit today!”, she tried to say over the sound of the wind passing by her ears. She pulled the small cord under one of her swords to find her parachute blossom open. However, her speed didn’t decrease as she had planned. She looked up and saw that her parachute had paper cut outs of ponies decorated all around the interior of the chute. Oops, did I forget to mention that? With no hope of a soft landing, Pinkie began screaming. Sure you may be facing extreme pain, but those cut outs really made that party we had last week! Pinkie tried to think of some retort but was cut short by the sight of a roof of a large tent. Luckily she happened to land near the bay’s main carnival tent. She tore through the roof into a live performance of a tightrope act. She landed in the safety net and was propelled back out through the top. She soared until landing on the top of the rocket centrifuge ride. The rocket spun around and around propelling her once again airborne. With her momentum she crashed into the top car of the ferris wheel sending it into a wild spin. The bolts keeping the wheel in place broke off from years of rust and neglect. The large wheel began tearing through the bay’s pier sending panicked fair-goers everywhere. Those unfortunate to be on the ferris wheel either bailed or hung on for dear life. Pinkie’s head was spinning and the world seemed a blur all around her. With one last ditch effect to get off, she focused all her strength into one jump. Luckily she landed near the pier’s fair gaming area and touched down in a large pile of stuffed bears. Forcing her way out of the the bear pit, she crawled to the ground and saw that she was alive. An angry FlutterHulk landed straight on top of her on it’s attempt to escape the armed forces behind it. Pinkie slowly and painfully pulled herself out of the wooden hole she made in the pier. She began crawling forward until she noticed a small lemonade stand in the distance. At the stand, she pulled herself onto the stand’s counter. There she saw a terrified proprietor huddled in the back corner. The proprietor looked at the scorched and broken mare before him, and cautiously poured Pinkie her lemonade. Pinkie downed the drink in one swig slamming the glass on the counter when she was done. The owner simply complied, not even beginning to ask if she could pay for these drinks. Pinkie rested the side of her head on the counter and slowly took sips of her cold lemonade. Come on, cheer up. So we had a little trouble and we didn’t get tacos, but we stopped a criminal empire. That was fun, right? Pinkie simply gave a long sigh. Suddenly in the distance, something caught her eye. It was blurry at first and she didn’t know if it was the lemonade or her concussion. It had large wooden wheels painted gold that was chipping off in some places. It had a colorful rainbow of an umbrella shading it from the sun. There was a mare wearing an apron that was covered in what seemed to be beans. “Maybe this day wasn’t so bad after all,” she said as she made her way to taco heaven.